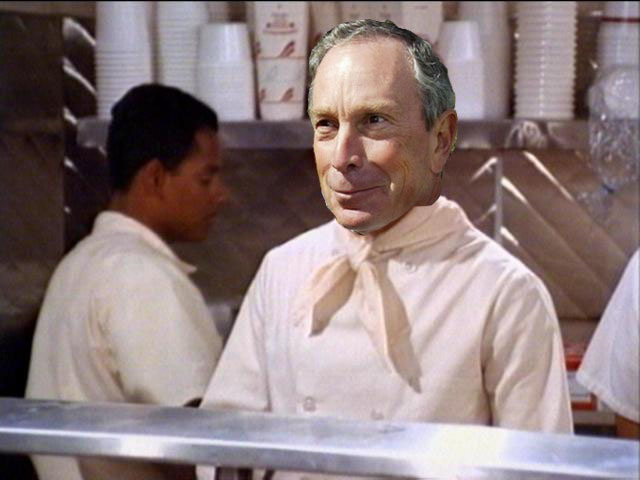 The Second Age: Bloomberg to City: No Soda for You! Bloomberg to City: No Soda for You! I'm not the biggest fan of Bloomberg personally—I think he's an egomaniac whose third term power grab was way out of line. That's not to mention Ray Kelly's actions under Bloomberg, Cathie Black, and his general "the rules don't apply to me" attitude. Policy-wise, however, I like some of what Bloomberg has done (or at least tried to do). He was a backer of congestion pricing, he instituted restaurant letter grades, he banned smoking in bars and restaurants, as well as parks and other public outdoor spaces. His public health campaigns have been one consistent bright spot in Bloomberg's mayoralty. Until this week. Bloomberg has proposed outright banning the sale of a cup or bottle of sweetened drink over 16 ounces (the size of a small drink at McDonald's). An action like this, without a doubt, would be the prototypical nanny state kind of government that Americans on both sides of the aisle should be up in arms about. Here is something perfectly legal and Bloomberg wants to ban it based on how much comes in a cup? When you take a step back and look at it, it is ludicrous. But Bloomberg's motives for this kind of extreme action are noble. He wants to counteract obesity, which is a rising problem in America. And it is not insignificant. A whopping 35.7% of Americans are obese. Not just overweight. Obese. Medical costs in 2008 associated with obesity were $147 billion. For scale, that is $7 billion more than the GDP of Hungary. Obesity also has externalities associated with it—namely, mortality and health insurance costs. Because medical costs are higher for the obese and premiums do not depend on weight, lighter people in the same pool pay for the food/exercise decisions of the obese. Furthermore, the negative health effects of obesity decrease the ability of the obese to pay for government-mandated social programs. Obesity does not just affect those who suffer from it, but in reality affects every member of society who pays for healthcare or any kind of government benefit (Social Security, Medicare, etc.) In today's current society, it violates John Stuart Mill's harm principle. One solution can be seen in the way government handles other societal harms, such as tobacco. Consuming cigarettes is a personal choice, one that the government has deemed the populous worthy of making. However, it is generally accepted (the tobacco industry notwithstanding) that smoking is bad for you. Not only is it bad for you, it is physically harmful to those in your immediate vicinity. The government's response to this has not been to ban tobacco products. It has taken another approach in the form of taxation. In other words, the federal, state and some local governments have decided to tax the hell out of tobacco to disincentivize people from consuming it. But has it worked? Overwhelmingly. Not only does a tax on tobacco decrease cigarette sales, that decrease is directly proportional to the size of the tax. So why can't we do what we've done with tobacco and just tax sweetened drinks over 16 ounces? We should then take the taxes and put them towards efforts to further curb obesity in the city, such as free workout programs or free cooking classes. So it really is not a matter of if these drinks will be banned, but when (the Times says it could be as early as next March). Bloomberg's ends are in the ballpark, but his means are not the way to go about it. Of course, it is important to note that even if Nanny Bloomberg does ban these drinks (and the next mayor does not somehow overturn the ban), it will not stop obesity. In addition to disincentivizing harmful habits, the city needs to incentivize positive ones. It would be a lot easier to provide these incentives from a city-wide soda tax. Don't forget that Paterson tried to pass a soda tax a couple years ago and it fell flat on its face. I know New York City is a different story than New York State, and I agree with you that putting tax revenue back into obesity programs is certainly better than an all-out ban, but I also think a ban is better than nothing being done at all. The other interesting piece here is that there's absolutely nothing stopping people from buying 2 16-ounce sodas at the same time. But there are such strong social norms against doing that that people view the band on 32-ounce cups as completely taking away freedom, when it's really just an example of choice architecture. Interesting stuff.